When Cornwall played Surrey at Richmond on Saturday, a search in the memory bank took me back 50 years, to the halcyon days of the County Championship, a competition which for many years was all-important, just one small step down from England trials. The early weeks of 1967 were about as exciting as you could get, when the Championship had real importance, this in no way wishing to be derogatory about the mighty achievements of our teams in more recent years. Prior to the Championship being somewhat devalued, it was fairly rare for a Cornwall team to win the Group Championship, the then matches against Devon, Somerset and Gloucestershire (especially) tough encounters against some of the best players in the country. Also, to cement the point, Cornwall had only ever lifted the County Championship once – which was way back in 1908, when they beat Durham 17-3 at Redruth. In 1966-67 Cornwall played four early season friendly matches, including one at Penzance which was drawn 6-all against a strong Lancashire side. These games were vital preparation for what lay ahead, the real test known to be a Championship opener against Gloucestershire at Bristol in October. That match was won 9-3, it followed by a more comfortable 14-3 win against Somerset at Redruth, and then an always welcome derby match victory 9-0 at Camborne against Devon – Roger Hosen, England's full-back that season, kicking three penalty goals. The Pirates were represented by centre Jimmy Glover and prop 'Stack' Stevens, and it was only the fourth time in their history that Cornwall had won all of their Group matches. The quarter-final was against Oxfordshire at Redruth in January, Cornwall winning 16-6 with Penryn's Graham Bate outstanding at full-back, and next up was a semi-final encounter at home to a strong Surrey team. 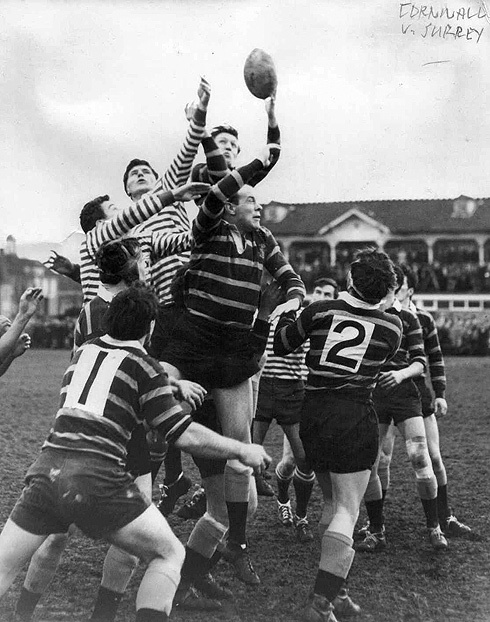 That game ended in a 6-all draw, leading to a replay taking place at the Richmond Athletic Ground just two weeks later. Cornwall kept the same side: Roger Hosen, Kenny Plummer, Jimmy Glover, Tommy Palmer, Derek Prout, Richard Sharp, Ian Davey, Ron Glazsher, Gerry McKeown, Ray George, John Allen, Alan Greep, Rex Buckingham, Roger Harris and 'Stack' Stevens, but they disappointingly lost 14-3, there no 'Boys Own' ending to a still remarkable, and wholly memorable eleven match season. Disappointing? Of course it was, but with a good crop of players to choose from it was no surprise that in 1968-69, the final would be reached, but that's a story for another day! Big crowds at the Menaye. I was there that day, along with my father and sister,massive crowd but a bitter disappointment.